A Card in Less Than an Hour! There were several comments on the Spellbinders blog post asking for larger images so NOW you can see it! And to prove that you CAN do it in less than an hour, here are the instructions- sorry I don’t have step photos! Create white card base 4.25 x 5.5″, with top fold. Emboss 4.25 x 5.5 “white cardstock with Spellbinders M-Bossabilities™ folder ES-001 Simplicity in the Spellbinders Grand Calibur® machine. Trim around embossed design edge, attach to card front with SCRAPBOOK ADHESIVES BY 3L™ 3D Foam Squares. Cut/emboss Floral Ovals #3 (#1 is the smallest) with white cardstock and Wings of Hope Butterfly with patterned paper. For both die cuts, leave the paper in the die and apply ink through the openings of the die template like a stencil. I also added some ink to the edges of the Floral Oval. Stamp the greeting into the Floral Oval with the same ink. Attach Floral Oval with 3D Foam Squares. Bend the Butterfly wings, add 3D Foam Squares to the body and attach to card. Add pearls to Butterfly body, Floral Oval and lower right corner. Its pretty easy, and I probably spent more time fussing about which patterned paper and ink to use than anything else! This entry was posted in Card, SCRAPBOOK ADHESIVES BY 3L, Spellbinders and tagged Butterfly, Clearsnap, Creative Impressions, Fancy Pants Designs, Quietfire, Spellbinders. Bookmark the permalink. Lovely card. Thanks for the idea of using the die template as a stencil to apply ink. 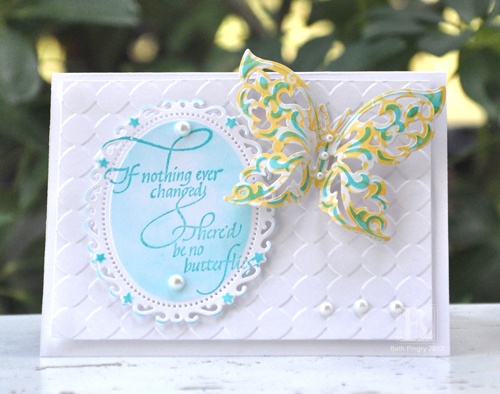 Beautiful and the sentiment so fitting 🙂 Love that you used patterned paper for the butterfly! I have all the same things on my to do list–except the running, LOL!